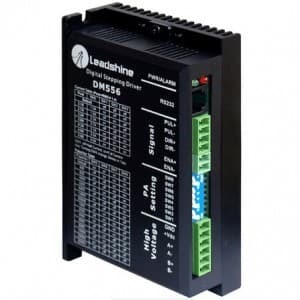 New Product: Leadshine Digital Stepperdrives and Compatibility PCBs | DamenCNC B.V.
Leadshine's DM series digital stepper drives are DSP-based innovative products adopting the latest stepper control technology. Those stepper motor drives feature anti-resonance, low-speed ripple smoothing, extra-low noise, and low motor heating, therefore they can offer excellent performance for stepper motor controls. Compared with most analog stepper drives, noise can be reduced up to 70%.Taking step & direction (drive supports analog input for speed control also available)control commands, the DM series stepper motor drives are easy to set up. There is a wide choice for the DM stepper motor drives to suit input voltage from 18 VDC to direct 120/230 VAC, and output current of 0.3 to 8.2A. DamenCNC has added these items to the shop, and also we have designed PCBs that make it easy to connect these drives to USBCNC CPU v4 or v5B. These items have also been added to the shop. When ordering a DM drive, the webshop, will automaticly advise the correct pcb.